In a display of strength and versatility that would be unimaginable today, Bob Gibson in 1965 pitched 13 innings in a start vs. the Giants on July 7, pitched four innings of relief against the Cubs on July 11 and, two days later, earned a save with two innings of relief in the July 13 All-Star Game. Well aware of Gibson’s workload, the Phillies’ Gene Mauch, National League manager, never hesitated to call on the Cardinals ace to protect a 6-5 lead over the final two innings of the 1965 All-Star Game in Minnesota. “Bob Gibson thinks he can get anybody in the world _ and I do, too,” Mauch told the Associated Press. The National League unleashed an array of hard throwers on the American League. Juan Marichal of the Giants started and was followed by the Reds’ Jim Maloney, Dodgers teammates Don Drysdale and Koufax and the Astros’ Turk Farrell before Gibson entered in the eighth. The American League scored all of its runs off Maloney. 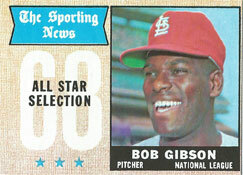 Gibson, the Cardinals’ lone all-star representative, retired the first two batters he faced, striking out the Tigers’ Willie Horton and getting the Yankees’ Bobby Richardson on a groundout. After he walked the Twins’ Zoilo Versalles, Bill Freehan of the Tigers followed with a single to center. When the throw from Willie Mays went to third, Freehan took second, putting two runners in scoring position for the next batter, the Twins’ Jimmie Hall. A left-handed batter, Hall hit a shot to center. Mays started for the ball, slipped and barely recovered in time to make a leaping, backhanded catch, ending the inning. In the bottom of the ninth, the Twins’ Tony Oliva led off with a double. Attempting a bunt, the Indians’ Max Alvis popped out to Gibson for the first out. Twins slugger Harmon Killebrew was up next. The crowd at Metropolitan Stadium was abuzz at the prospect of their prodigious home run hitter driving in his Twins teammate Oliva from second with the tying run. Gibson had “a lot of mustard” on his fastball, Killebrew told United Press International. “The ball just seemed to drop under my bat,” Killebrew said. American League manager Al Lopez sent a left-handed pinch-hitter, the Yankees’ Joe Pepitone, to bat next. In the clubhouse, National League catcher Joe Torre of the Braves soaked his left hand in warm water to ease the soreness from having so many fastballs slam into his mitt.